Last week I wrote about a book I was reading, Edith Eger’s “The Choice”. That work tells her story as a survivor of Auschwitz and the impact the unimaginable trauma had on her. Edith, like Viktor Frankl, survived because she knew, no matter the circumstances, that she always had choices. Edith’s journey following her liberation led her to a point of confrontation of the past. After much painful reflection, she came to the realisation that she would never overcome the past. It cannot be transcended or excised. Her experiences lived on within her. They made her into the person she is today. However, she experienced real freedom from her suffering because she learned to forgive. I think the most powerful climatic statement in the book is when Edith says, “I don’t know that forgiving Hitler isn’t the hardest thing I’ll ever do. The hardest person to forgive is someone I’ve yet to confront: myself”. In two weeks’ time, we will all enjoy a long weekend. Some of you might even attend a church service to celebrate Easter. At its core, the Easter story is about forgiveness. It is about an opportunity to be released from the mistakes of our past, present and future; we just have to accept the free offer that God in all his graciousness holds out to us. 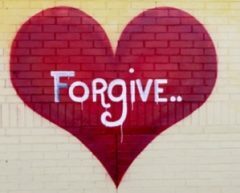 Immense healing, freedom and peace is in knowing that we are truly forgiven, and because we are forgiven, we have permission to forgive ourselves. We do not have to hang onto that pain or guilt. If that isn’t good news enough, there’s more. When we accept the free gift of forgiveness, we also receive the gift of a life beyond what we currently experience. This life is not all that there is – there is far more. Now that I’ve left you with enough of a teaser, why don’t you find out more? If you have a bible, I encourage you to read the Gospel of Mark. Alternatively, look out for an Easter service and hear first-hand about this great news. Lastly, I would also like to mention the decision of our School Council Chair, Mr Rob Law, to step down from the St Paul’s School Council for personal reasons. I am grateful for the wisdom and experience Rob has brought since he was appointed to Council a little over a year ago, and I wish him all the best in the future. The Diocese will shortly commence the process of appointing a new Chair.